Ah, Spring is coming again! For growers like myself, we begin to wake up from hibernation and get ready to take on another year: planning, planting, weeding, harvesting, and, yes, BLOGGING. Our big project this year is to grow our CSA from 2 shares to 15. With the birth of our son, Willem, we decided to find more CSA customers and attend fewer markets. I like selling at the farmers market, but it is pretty tough to juggle packing BOTH produce and kids. CSA share from our farm, July 2006. One share costs $400 for the season (16 weeks from June-October) and you have the option of adding a cut flower share for an additional $25 (6-8 weeks from July-September). 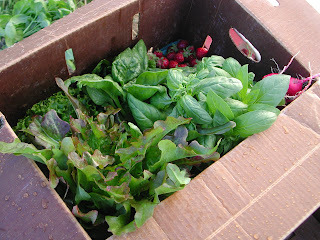 With each share you receive a box each week of whatever is in season each. Think of it as a subscription, but instead of receiving a magazine or newspaper, you get produce. We will deliver to your home or you can pick up at the farm. You can see from the picture at the left an example of the variety you receive each week: basil, strawberries, red oakleaf and greenleaf lettuce, radishes, spinich, breen onions, broccoli, and kale.